Peripheral nerve injury causes distal nerve stump degeneration and impairment of nerve function. Polyethylene glycol (PEG) induces axolemmal fusion of proximal and distal nerve stump axons. PEG therapy inhibits degeneration and leads to rapid recovery of nerve function. PEG treatment has not yet been compared with any other treatment with confirmed neuroregeneration enhancing impact. FK-506 is an immunosuppressive drug with reported pro-neuroregenerative potential in nerve injury models. 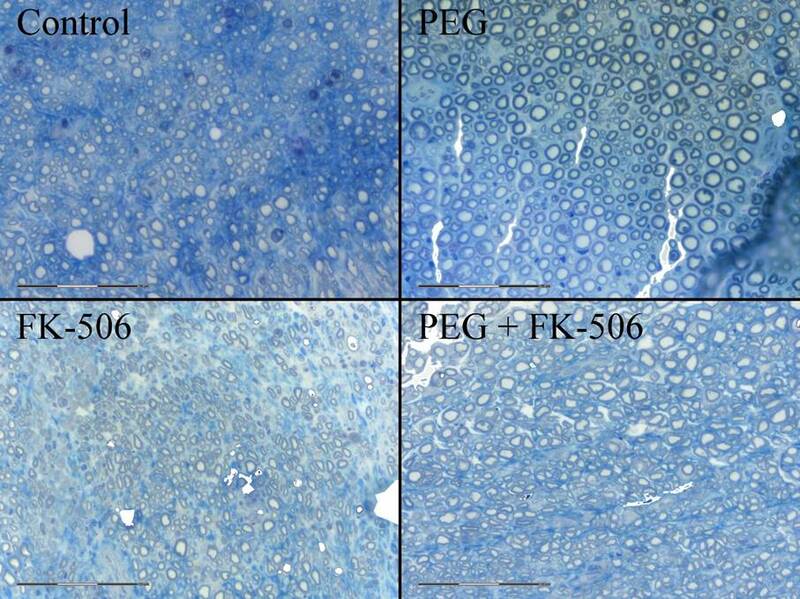 The aim of this study was to compare the neuroregenerative effects of PEG treatment and preinjury FK-506 administration in a rat model of sciatic nerve transection injury. 28 male SPRD rats divided into 4 groups underwent unilateral sciatic nerve transection with primary suture - based repair. Group A (control group) received placebo injections. Group B received placebo injections and PEG treatment. Group C received FK-506 injections. Group D received both FK-506 injections and PEG treatment. Functional outcomes were assessed using the sciatic functional index and prick test. Nerve specimens were harvested for histomorphometric analysis 12 weeks after the initial surgery. Histomorphometric analysis (Fig. 1) showed increased neuroregeneration in all groups receiving treatment (higher G Ratio) compared with the control (p < 0.001). Group D (PEG + FK-506) had better results: higher mean axon area, G Ratio (p < 0.001), perimeter and axon count (p > 0.05) than other groups. Myelin sheath parameters in group D correlated with remyelination process characteristics. PEG treatment (groups B and D) effected in the improved sciatic functional index during the first postoperative week although results were not significant compared with groups A and C. All treated groups had better mean prick test scores than the control (p > 0.05) at study endpoint. According to histomorphometric analysis, polyethylene glycol combined with FK-506 results in superior neuroregeneration outcomes when compared with simple suture-based nerve repair (control), PEG or FK-506 separately. Figure 1. Histology slides from distal nerve section sites of the four groups: A – Control, B – PEG, C – FK-506, D – PEG + FK-506.